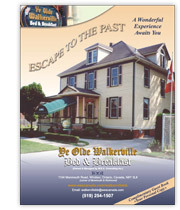 The guestbook magazine, Escape To The Past, is available to all guests of the Ye Olde Walkerville Bed & Breakfast. The Escape To The Past magazine is a practical guide to the city of Windsor that includes city information, history, climate, transportation, attractions and useful maps. Escape To The Past also focuses on the history of the Walkerville area, as well as local and surrounding places of interest. View a condensed (short version) preview of the magazine by clicking on the button below.